I love snack mixes and can scarf huge handfuls in record speed. This is one of those recipes that I shouldn’t even make because scarfing was in full effect. It’s a new favorite snack mix and I’ve sampled plenty. 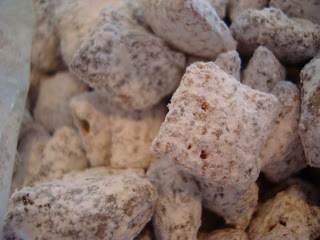 Puppy Chow, White Chocolate Peanut Butter Puppy Chow, White Trash Candy (I didn’t come up with the titles). I love them all. This mix comes together in under 10 minutes, which is a blessing and a curse. I used popcorn in it, which is something I eat almost daily. Usually with coconut oil sprayed lightly, and sprinkled with nutritional yeast and stevia. I love the combo of cheezy, salty, and sweet, and it’s healthy. 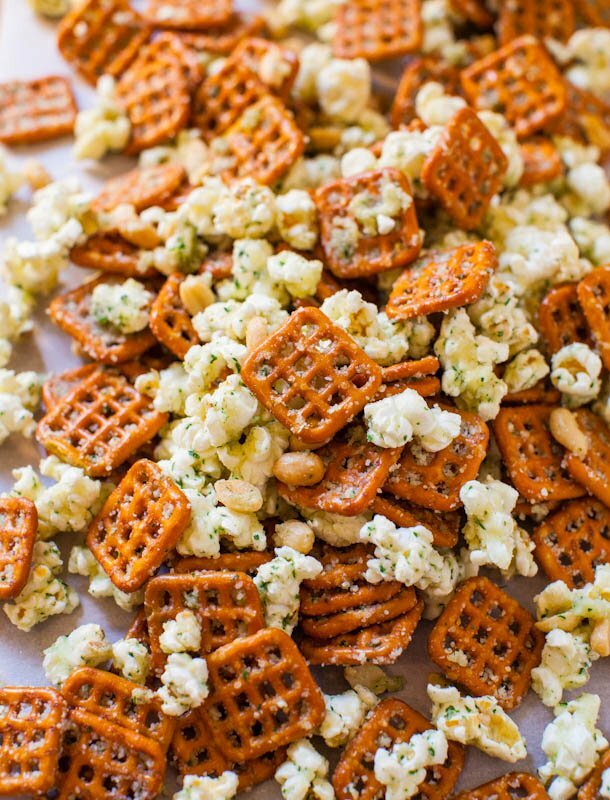 The popcorn in the snack mix is a little different. 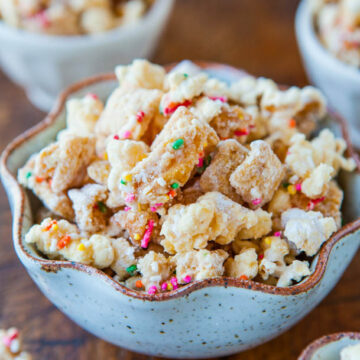 It’s coated with a melted white chocolate and peanut butter mixture, along with Chex cereal, sprinkles, and two broiled buttery waffles. Start by generously buttering two frozen waffles or making your own waffles if you’d like. Trader Joe’s multi-grain from the freezer case work just dandy. Broil them for a couple minutes and don’t leave the oven. Charred waffles happen quickly and you’d have to start over. I despise starting over. You could also toast them in a regular toaster and butter them. I thought broiling would make them crispier. In the end, not sure if broiling versus toasting really mattered in terms of crispiness, so do what’s easiest. Chop them up into little pieces and put them in a big mixing bowl. 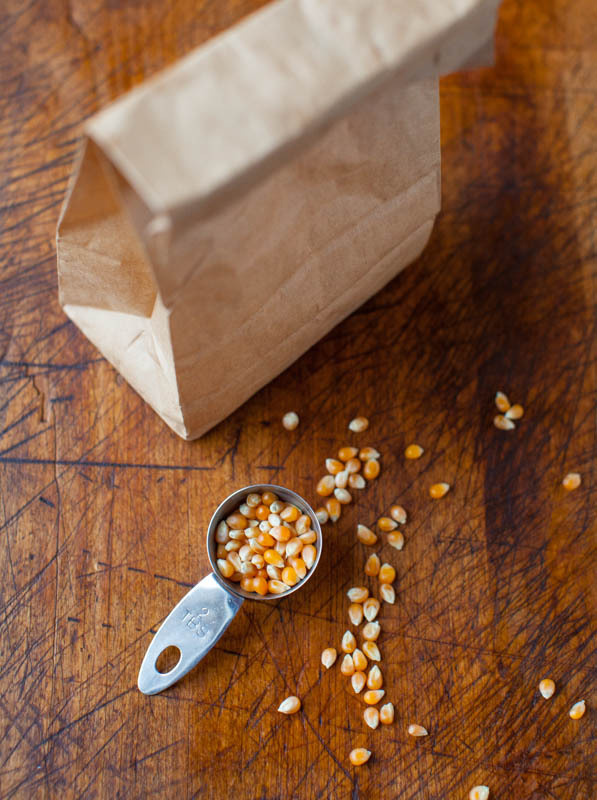 Place 2 heaping tablespoons popcorn kernels in a brown paper sack and microwave for 90 seconds. This yields about 4 cups popped popcorn. This is how I always pop popcorn. Works like a charm, every time. No added oil, grease, salt or chemicals. And no dishes dirtied. I re-use the paper bag at least 20 times. Truly the cheapest and healthiest way to make microwave popcorn. Chop 6 squares (6 ounces) of Vanilla Candiquik or your favorite white chocolate bar. Put a piece of parchment paper on your cutting board before you start chopping to contain all the chocolate dust, rendering cleanup much faster and easier. Melt the chocolate, about 1 minute total, but stop, stir, and check every 15 seconds. White chocolate scorches and seizes quickly and easily, which is why I opted for Candiquik since it’s less prone to that. 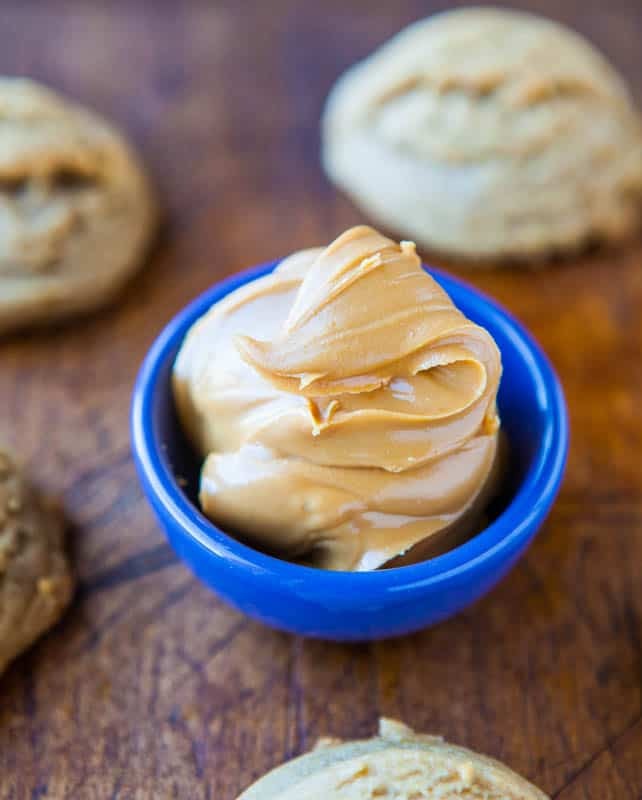 Stir in a hearty dollop of peanut butter to the melted white chocolate. Pour this over the buttery waffle pieces, popcorn, Chex, and stir. Feel free to get creative and mix-and-match the add-ins. 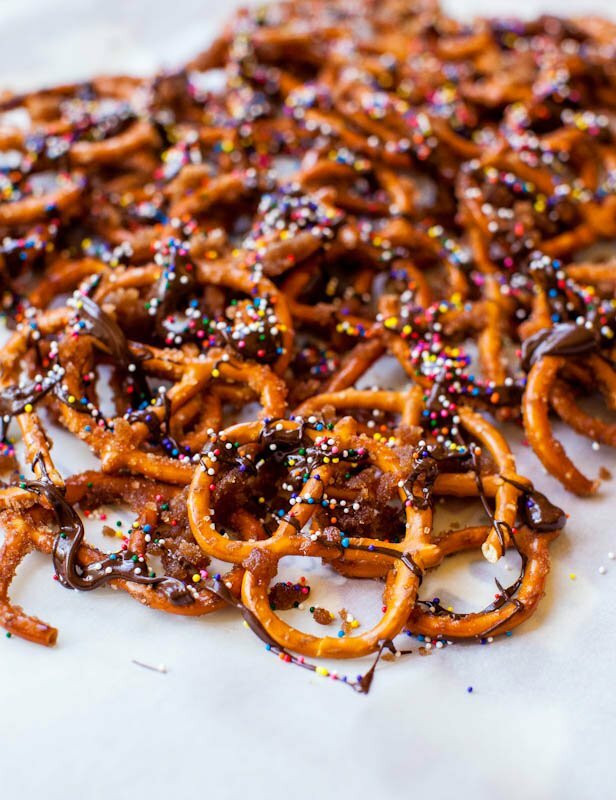 Try mini pretzels, caramel corn, chopped Graham Crackers, another cereal, chopped candy bar pieces, peanuts or your favorite nut. Clear out your odds and ends and bottoms of bags that plague your cupboard. Everything tastes amazing drenched in melted white chocolate-peanut butter. 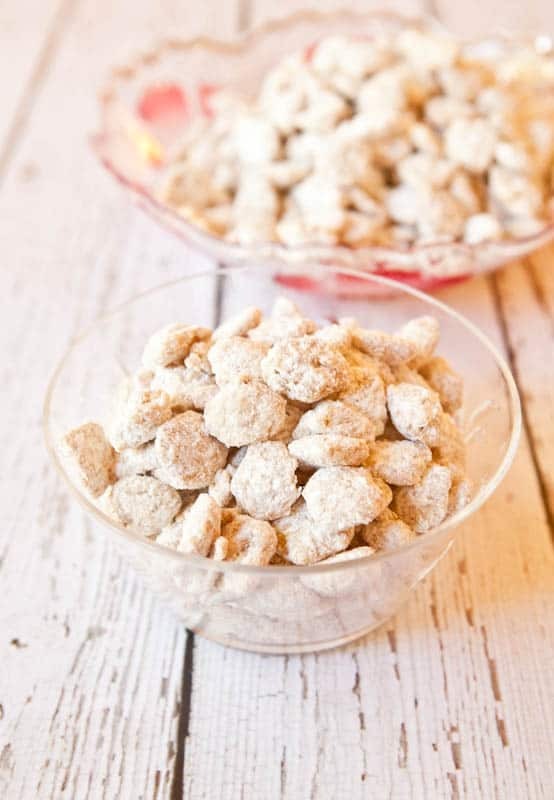 Dust or douse with confectioners’ sugar and sprinkles. Your choice. I lean toward dousing. Stir and dig in. In theory, this should keep for nearly a week in an airtight container or gallon-sized Ziplock, although it’s crispiest when it’s freshest. I don’t get it to last more than two days because it’s crazy good. The waffles are like little buttery sponges. Soft, squishy, and full of butteriness. 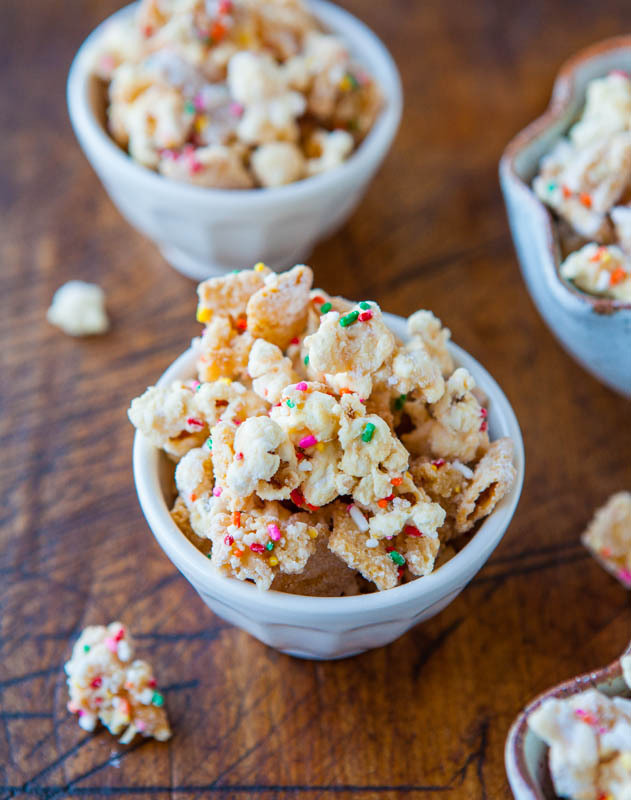 Contrasted with crispy, crunchy Chex and the texture-filled popcorn. It’s a texture party in your mouth. The white chocolate flavor is the more pronounced than the peanut butter, which does more to bulk up the coating so it’s thicker. 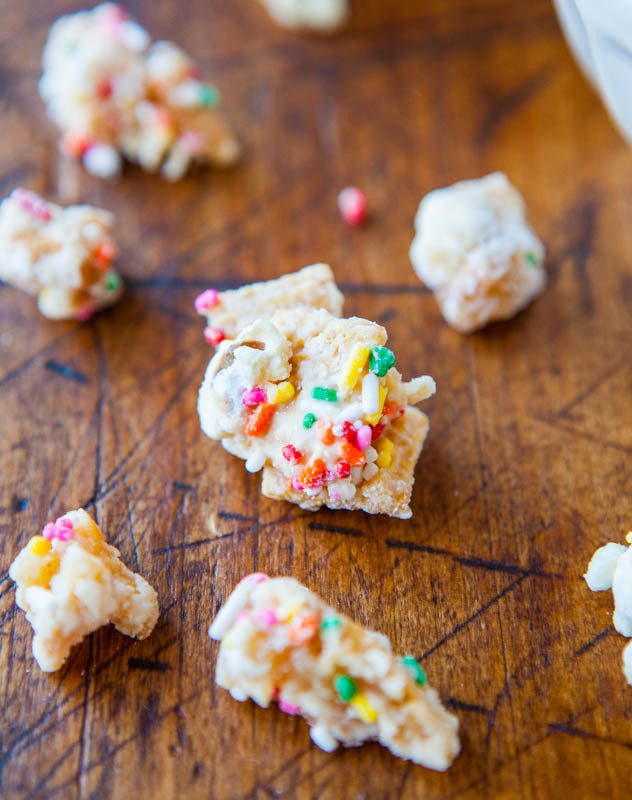 I love those little nuggets with sprinkles clung to them. You’ve been warned that it’s super addictive. The good thing is that the batch size isn’t ridiculous, and fills just over half of a gallon-sized Ziplock. A manageable quantity, especially if you’re tempted to eat the whole batch, pronto. Sweet, crunchy, crispy, buttery, fast, and easy. With white chocolate and peanut butter. Hard to resist. This is a new favorite snack mix and it’s so addictive. 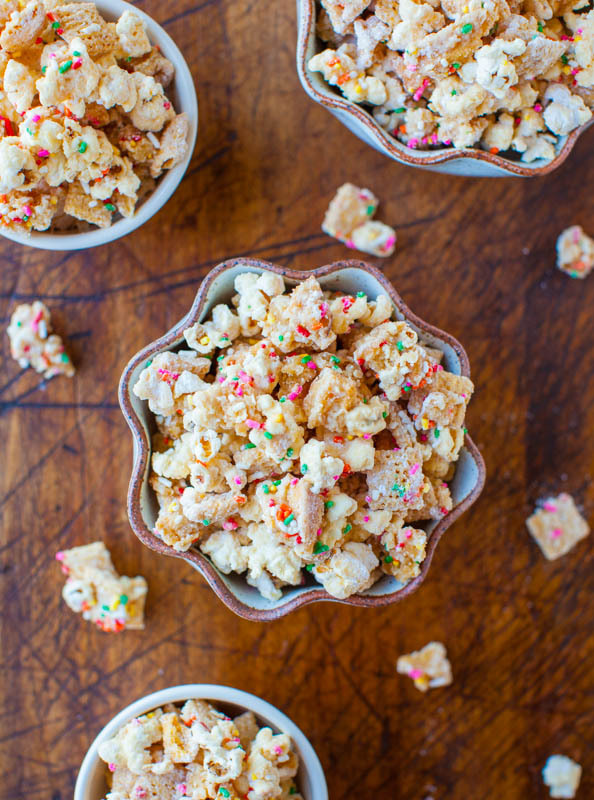 There’s Chex cereal, popcorn, and buttery waffles. Everything is coated with a melted white chocolate-peanut butter mixture before being tossed with confectioners’ sugar and sprinkles. 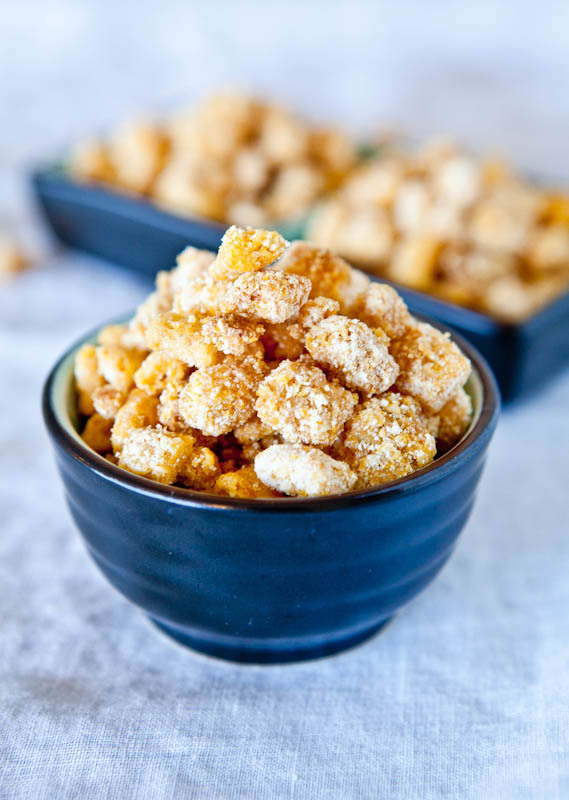 It’s sweet, crunchy, crispy, buttery, fast, and easy. It’s ready to go in less than 10 minutes – almost too easy! Place Chex in a large mixing bowl; set aside. 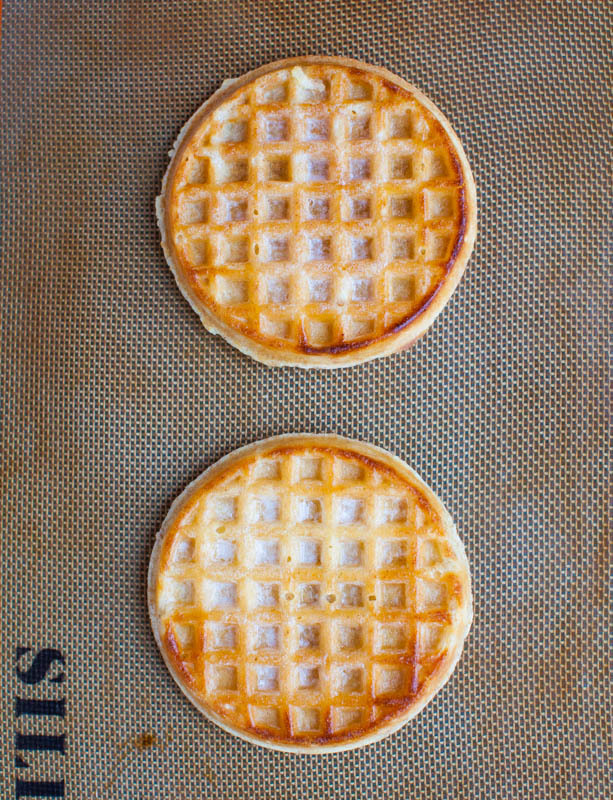 Turn broiler on and place two frozen waffles on a baking sheet and butter each waffle with 1 tablespoon butter. Broil for 2 to 3 minutes, or until golden and toasted; don’t turn your back for a second because they burn easily. Or, toast waffles in a regular toaster and butter them. Chop waffles into small pieces and place pieces into mixing bowl; set aside. Place the unpopped popcorn kernels in a brown paper bag, fold top down twice, and microwave on high power for about 90 seconds, or until popping sounds become less frequent. 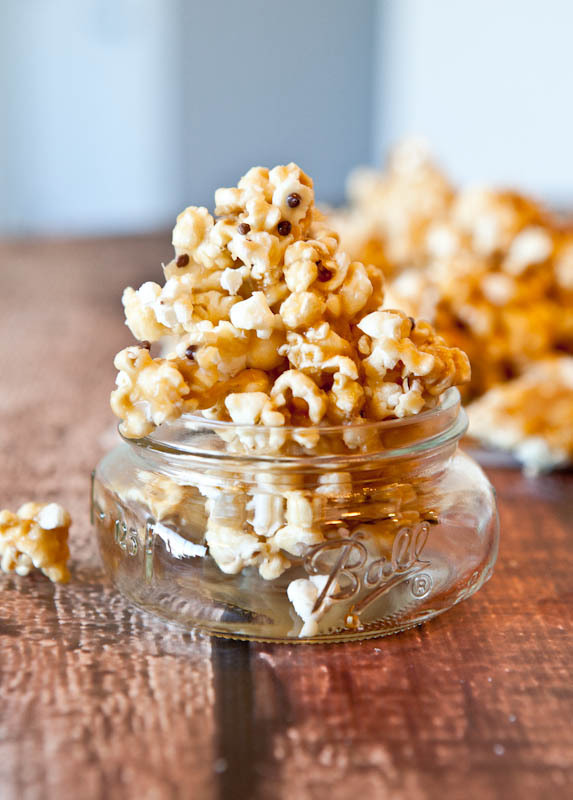 No need to add oil, butter, or anything else to the bag; just the popcorn kernels and microwave it. Place the popped popcorn in the mixing bowl making sure to remove any unpopped kernels; set aside. Place white chocolate in a small microwave-safe bowl and heat to melt, about 1 minute total, but stop to check and stir every 15 seconds. White chocolate is very prone to scorching and seizing, and heating should be done in short bursts. After chocolate can be stirred smooth, stir in the peanut butter. Stir until combined. Pour melted mixture over the dry ingredients in the mixing bowl. Toss and stir to coat evenly. Sprinkle slowly with confectioners’ sugar as desired to soak up some of the melted mixture, tossing and stirring to coat. Add the sprinkles, optional salt, and toss to distribute. Mix may be served immediately, or allow it to firm up a bit more, about 30 minutes or so. Mix will keep in an airtight container or gallon-sized Ziplock bag for up to 1 week but is crispiest and best when fresh. 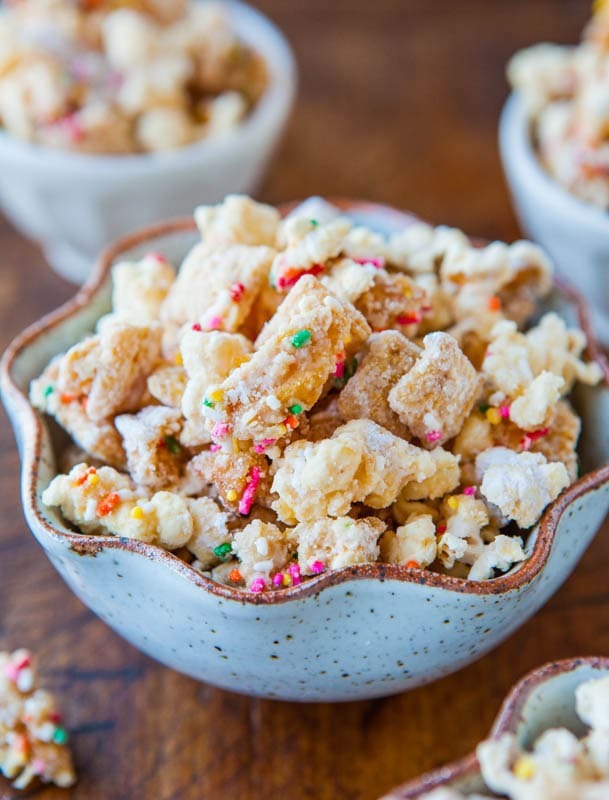 Optional suggestions – Mix-and-match the add-ins by trying mini pretzels, caramel corn, chopped Graham Crackers, Cheerios or other cereal, chopped candy bar pieces, peanuts, or other nuts. 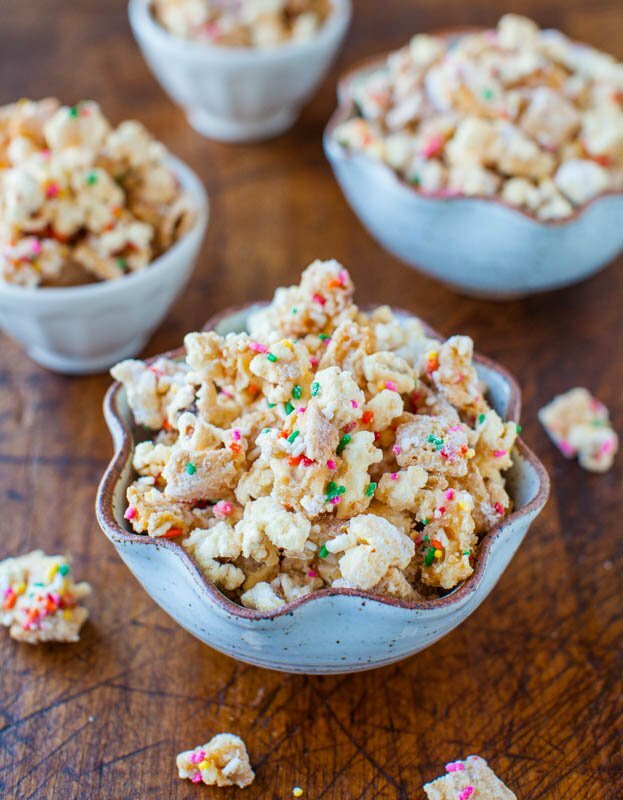 I would start with 1/2 to 1 cup of anything optional, and if necessary, you may need to reduce the amount of popcorn or Chex as indicated in the recipe, so that everything included is properly coated with white chocolate; or simply melt a bit more chocolate. 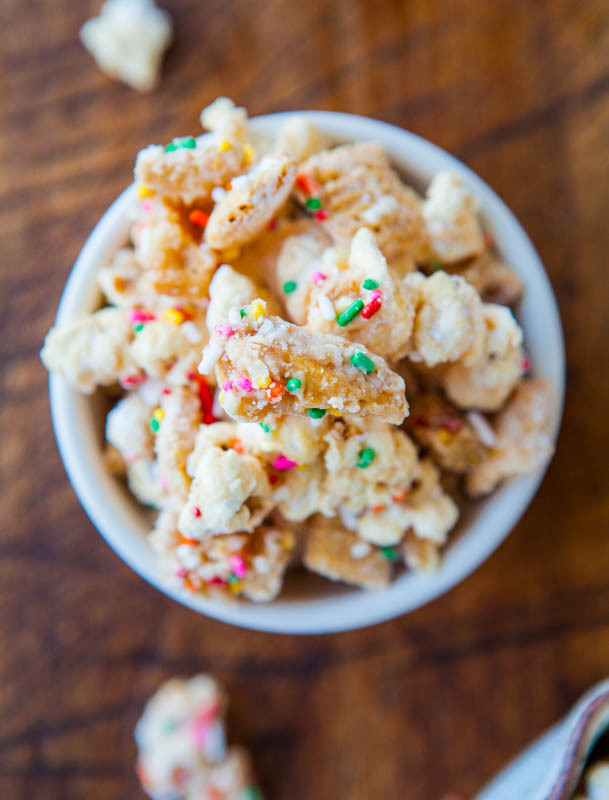 Do you like snack or party mixes? 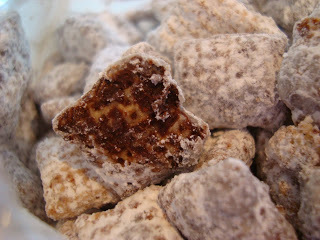 Puppy Chow or other similar recipes? Do you prefer sweeter or more savory party mixes? Sweet all the way for me. Salty-and-sweet is good, but I’ll always take cake batter or white chocolate over Parmesan ranch. Leave links to your favorite recipes. So, I just made this with the addition of M&Ms and I doubled it, and OMG it is amazing! Everyone is loving it…I can’t see this lasting long! Oh my goodness, this looks dangerous ;) this is a brilliant mix! Just went and bought some white popcorn kernels & popped them in a brown paper bag as you suggested. Came out perfect! Topped with some nutritional yeast and trivia too! ;-) So delicious & easy…. and healthy! I’m with you and can wolf down snack mixes in record time, especially ones coated in white chocolate!! Sounds wonderful! 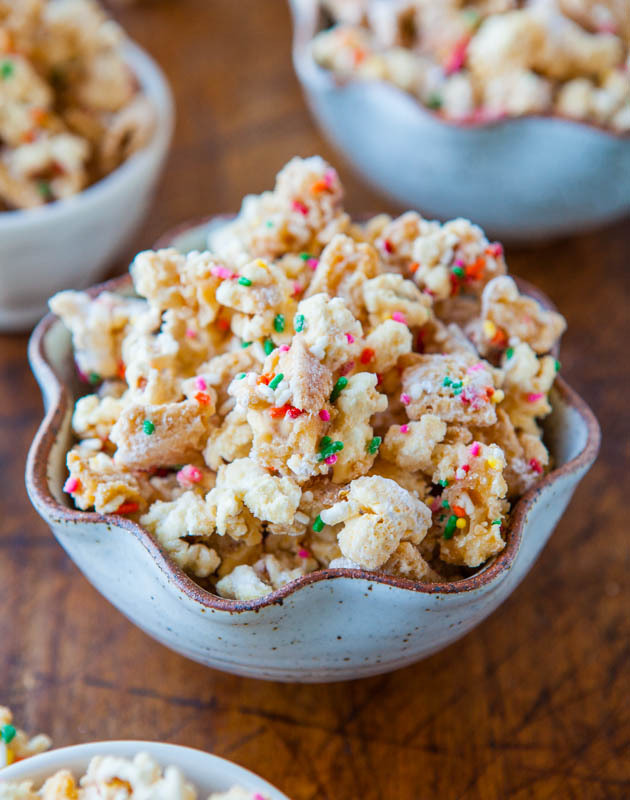 Pingback: White Chocolate and Peanut Butter Buttery Waffles Snack Mix!